Kana is a general term for the syllabic Japanese scripts hiragana (ひらがな) and katakana (カタカナ) as well as the old system known as manyogana. These were developed from the logographic characters of Chinese origin, known in Japan as Kanji (漢字; Chinese pronunciation "hànzì"), as an alternative and adjunct alphabet. In addition, kana were borrowed into Taiwanese to indicate the pronunciation of Chinese characters like furigana during the Japanese occupation of Taiwan. Hiragana and katakana (grouped vertically). Syllables in parentheses are archaic. Neither modern hiragana or katakana have kana to represent ye, yi or wu sounds. However, ye is believed to have existed as a syllable in pre-Classical Japanese (prior to the advent of kana), and is generally represented (for purposes of reconstruction) by the kanji 江. In later periods, the syllable we (represented by the katakana ヱ and hiragana ゑ) came to be realized as [jɛ], as demonstrated in 1600s-era European sources, but later merged with the vowel e and was eliminated from official orthography in 1946. "Ye" in modern orthography is commonly represented using いぇ or イェ. While no longer a part of standard orthography, both wi and we are still sometimes used stylistically, such as in ウヰスキー for "whiskey," and ヱビス for Yebisu, a beer brand. The hiragana consist of a basic set of characters, the gojūon , which can be modified in various ways. By adding a dakuten marker ( ゛), an unvoiced consonant such as k or t is turned into a voiced consonant such as g or d: k→g, t→d, s→z, and h→b. Hiragana beginning with an h can also add a handakuten marker ( ゜) changing the h to a p. A small version of the hiragana for ya, yu or yo (ゃ, ゅ or ょ respectively) may be added to hiragana ending in i. This changes the i vowel sound to a glide palatalization. Addition of the small y kana is called yōon. A small tsu っ called a sokuon indicates a geminate (doubled) consonant. It appears before fricatives and stops, and sometimes at the end of sentences. In informal writing small versions of the five vowel kana are sometimes used to represent trailing off sounds (はぁ, ねぇ). Katakana ("fragmentary kana") are characterized by short straight strokes and angular corners, and are the simplest of the Japanese scripts. Today, katakana is most commonly used to write words of foreign origin (“gairaigo”) that do not have kanji representations. For example, "George W. Bush" can be expressed as ジョージ・W・ブッシュ. Katakana is also used to represent onomatopoeia, technical and scientific terms, and some corporate branding. Pre-World War II official documents mixed katakana and kanji in the same way that hiragana and kanji are mixed in modern Japanese texts, that is, katakana were used for okurigana and particles such as wa or o. Katakana were also used for telegrams in Japan before 1988 and before the introduction of multibyte characters in computer systems in the 1980s. Most computers used Katakana instead of Kanji and/or Hiragana for output. シューマイ (焼売), shūmai, from Cantonese siu maai, a kind of dim sum. The very common Chinese loanword ラーメン (rāmen) is rarely written with its kanji 拉麺. Katakana spelling differs slightly from hiragana. While hiragana spells long vowels with the addition of a second vowel kana, katakana usually uses a vowel extender mark called a chōon. This mark is a short line following the direction of the text, horizontal in yokogaki, or horizontal text, and vertical in tategaki, or vertical text. However, it is more often used when writing foreign loanwords; long vowels in Japanese words written in katakana are usually written as they would be in hiragana. There are exceptions such as ローソク(蝋燭)(rōsoku)(candle) or ケータイ(携帯)(kētai)(mobile phone). A small tsu ッ called a sokuon indicates a geminate (double) consonant. For example, bed is written in katakana as ベッド (beddo). Related sounds in various languages are hard to express in Japanese, so Khrushchev becomes フルシチョフ (Furushichofu). Ali Khamenei is アリー・ハーメネイー (Arī Hāmeneī). Kana can be written in small form above or next to lesser-known kanji in order to show pronunciation; this is called furigana. Furigana is used most widely in children's books. Literature for young children who do not yet know kanji may dispense with it altogether and instead use hiragana combined with spaces. The history of the Japanese language is usually divided into four periods, distinguished primarily by changes in phonology, morphology, and vocabulary: Old Japanese (to the eigth century); Late Old Japanese (ninth–eleventh century); Middle Japanese (twelfth–sixteenth century); and Modern Japanese (from the seventeenth century). The most significant changes in sound have been the shift of initial p- to h-, the loss of three vowels ï, ë, and ö, and the disappearance of vestigial vowel harmony. Older “finite” forms of verbs and adjectives have been replaced with noun-modifying forms. Though Japanese vocabulary is largely indigenous, from the sixth to the ninth century the Chinese language strongly influenced its development. A large percentage of Japanese words derive from Chinese loan elements, just as English has borrowed extensively from Greek, Latin, and French. The adoption of Chinese characters for writing can be traced to the third century, but any surviving text prior to the eighth century is only a few words long. Characters originally used to write Chinese became symbols for native Japanese words with similar meanings to the original Chinese. During this process the Chinese characters were simplified and written in a more cursive style, so that in many cases they no longer resemble their original Chinese form. Every Chinese character used in writing the Japanese language has acquired a two-fold reading. A character can represent a Japanese word that imitates the sound and meaning of the original Chinese word (the on reading); or it can represent a native Japanese word with the same meaning but a different sound (the kun reading). The kun reading usually applies when a character is used by itself. Every character also has a third use; its on or kun sound can be used to represent a Japanese syllable phonetically. A kanji used this way as a phonogram is called a kana. Both hiragana and katakana developed from the ancient kana system (man'yōgana), a kind of phonetic character using kanji. Kana is traditionally said to have been invented by the Buddhist priest Kūkai in the ninth century. Kūkai certainly brought the Siddham script home on his return from China in 806; his interest in the sacred aspects of speech and writing led him to the conclusion that Japanese would be better represented by a phonetic alphabet than by the kanji which had been used up to that point. Hiragana's character shape was derived from the Chinese cursive script (sōsho). 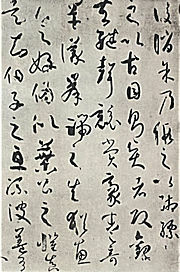 Shown here is a sample of the cursive script by Chinese Tang Dynasty calligrapher Sun Guoting, ca. 650 C.E. Kanji were used as phonograms as early as the sixth century, but it was not until the ninth century that standardized forms of kana began to develop. Gradually two systems of phonetic representation developed, both based on kanji. Hiragana (“common kana”) was created by simplifying and stylizing the cursive kanji (man'yōgana) used as phonograms in the Man'yoshu (759), an eighth-century imperial anthology of poetry. Hiragana came into wider use through the writing of poetry, diaries and novels by women of the court during the Heian period (794 – 1185). Men continued to write in kanji, and hiragana was known as onnade, or “letters of women.” Gradually male authors began using hiragana, with its flowing style, for writing literature and for unofficial writing such as personal letters, while katakana and Chinese were used for official documents. Originally, all sounds had more than one hiragana. In 1900, the system was simplified so each sound had only one hiragana. Other hiragana are known as hentaigana (変体仮名). The poem Iroha-uta ("Song/poem of colours"), which dates to the tenth century, uses every hiragana (except n ん) once. In the chart below, the romanization shows the hiragana; the reading in modern Japanese is in parentheses. Note that the last line begins with an obsolete kana (we ゑ). (yoi mo sezu) Shall no longer delude you. Katakana (‘partial kana”) developed from various systems of notation used by priests to aid in the reading of Chinese texts and Buddhist scriptures by using abbreviated kanji strokes to supply Japanese particles and endings missing in the Chinese. The first katakana was highly individualized and differed from sect to sect and even from one individual to another. By the tenth century, however, as its usage became more popular, common elements began to appear. Japanese was written with a combination of kanji and katakana until the fifteenth century, when hiragana symbols took over as the popular and literary medium. Katakana was still used for scholarly and practical writing. In modern Japanese, katakana is used only for machine-printed telegrams and memos, and for foreign loan-words, onomatopoetic words, and the scientific names of species. The orthography of kanji and katakana was reformed after World War II; The present set of kana and rules for their usage were codified in 1946. The thousands of kanji characters were restricted to a list of 1,850 symbols for official and everyday use, and the method of writing them was greatly simplified. During the early 1980s, another ninety-five kanji were added to the list, and additional simplifications were adopted. Kana spellings are now based on contemporary pronunciation instead of on the sounds of Late Old Japanese. The following table shows hiragana together with their Hepburn romanization. 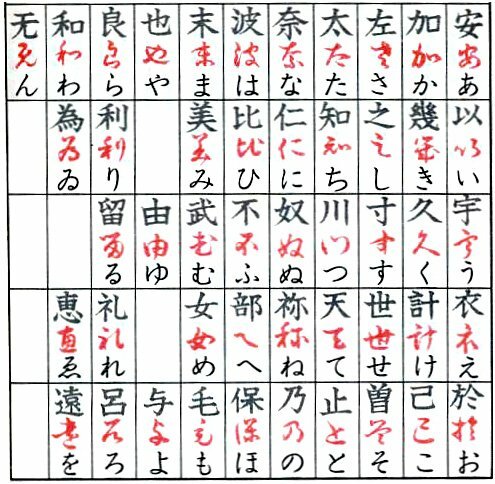 The obsolete kana are shown in red romanization. There are 105 cases. The sound ti is spelled てぃ, but this sequence of sounds is found only in loan words, so is normally written only in katakana. The combinations にゃ, にゅ, and にょ are not to be confused with the sequences んや, んゆ, and んよ. The combinations of に with a small y kana each represent a single mora, while the sequences of ん followed by a large y kana represent two separate morae. The distinction can be illustrated with minimal pairs such as かにゅう ka-nyu-u, "joining," and かんゆう ka-n-yu-u, "persuasion," which are easily distinguished in speech, although in some romanization styles they might both be written kanyu. In Hepburn romanization, they are distinguished with an apostrophe: kanyū and kan'yū. Kana are the basis for collation in Japanese. They are taken in the order given by the gojūon (あ い う え お … わ を ん), though iroha ordering is used for enumeration in some circumstances. Dictionaries differ in the sequence order for long/short vowel distinction, small tsu and diacritics. As the Japanese do not use word spaces (except for children), there can be no word-by-word collation; all collation is kana-by-kana. Japanese is a polysyllabic language using five vowels a, i, u, e, o, and fifteen consonants p, t, k, b, d, g, ts (ch), s (sh), z (j), m, n, r, h, y and w. The Japanese language is composed of a number of dialects, some of them mutually unintelligible. Most Japanese dialects are characterized by differences in the use of pitch accents, inflections on nouns, and endings used to conjugate verbs and adjectives. A complex system of personal pronouns reflects gender, age and an intricate social hierarchy. Mainland dialects can be categorized into four interrelated groups, but there are significant differences between the mainland dialects and those of the Ryuku Islands. The rapid spread of literacy and elementary education that began after the Meiji Restoration (1868) helped to establish a common written language based on the dialect of residential Tokyo. Most people across Japan now speak this common tongue, though with different accents. The assimilation of local dialects has been accentuated by large scale migration to the cities and by the impact of radio and television. The Hiragana range in Unicode is U+3040 ... U+309F, and the Katakana range is U+30A0 ... U+30FF. The obsolete characters (WI and WE) also have their proper codepoints, except for hentaigana, which are considered glyph variants of more common kana. Code points U+3040, U+3097, and U+3098 are unassigned as of Unicode 4.1. Characters U+3095 and U+3096 are hiragana small ka and small ke, respectively. U+30F5 and U+30F6 are their katakana equivalents. Characters U+3099 and U+309A are combining "dakuten" (voiced sound symbol) and "handakuten" (semivoiced sound symbol), which correspond to the spacing characters U+309B and U+309C. U+309D is the hiragana iteration mark, used to repeat a previous hiragana. U+309E is the voiced hiragana iteration mark, which stands in for the previous hiragana but with the consonant voiced (k becomes g, h becomes b, etc.). U+30FD and U+30FE are the katakana iteration marks. U+309F is a ligature of "yori" (より) sometimes used in vertical writing. U+30FF is a ligature of "koto" (コト), also found in vertical writing. Posdneeff, John Batchelor, and J. L. Pierson. 1929. The Transactions of the Asiatic Society of Japan. Tokyo: Asiatic Society of Japan. Umehara, Takeshi. 1984. Bringing Japan's ancient past to light. Washington, D.C.: National Institute for Research Advancement. Simon Ager. Origin of Japanese Hiragana, Omniglot. Simon Ager. Origin of Japanese Katakana, Omniglot. Kana web translator Transliterate Kana to Rōmaji. This page was last modified on 11 April 2018, at 14:14.